Eric Edwards can cite the date his life turned toward addiction: Feb. 19, 2012 – the day his son Dylan died after fighting leukemia most of his life. Dylan was 5. But that release brought debilitating guilt. That morning brought him a new life. “They took me to a detox facility in Asheville. I was there for seven days.” Once he was stable, he was sent to The Turning Point, in Moultrie, Ga., which offers detoxification and rehabilitation. “I was there for 43 days. When it was completed I was homeless. In Brevard they told me about The Haven.” That was two days before Christmas 2015. “I didn’t know anyone here.” But he found a niche. He began working with special-needs adults. “I fell in love with it. Worked in all the group homes, I was there for almost two years.” The executive director offered him a job as shelter manager at The Haven. 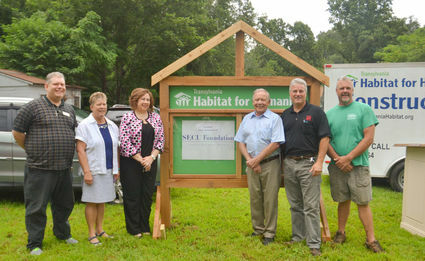 Pictured left to right are Eric Edwards, new Habitat homeowner; Carson Griffin, former SECU Advisory Board member; Cindy Hubbard, vice president for the Brevard State Employee Credit Union; Don Campbell, Transylvania Habitat president; Brevard Mayor Jimmy Harris; and Mike Krauter, Transylvania Habitat construction superintendent. Photo courtesy of The Transylvania Times. On a Monday morning in July, 2017, Transylvania Habitat for Humanity broke ground on its 63rd home in Transylvania County and 36th home in the City of Brevard. 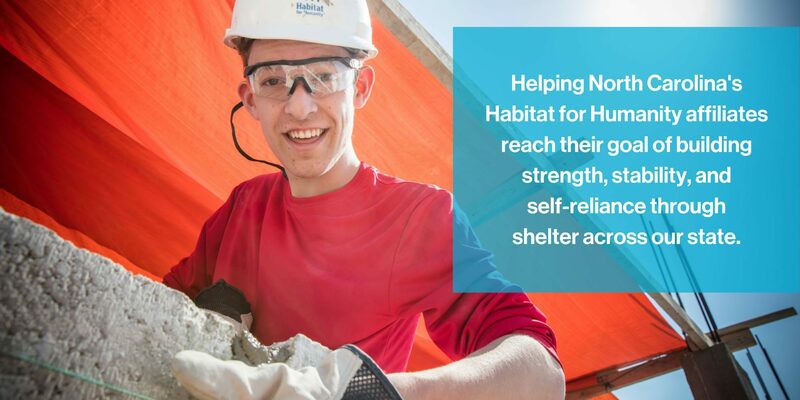 This home was constructed thanks in part to the State Employees Credit Union Foundation’s Mountains-to-the-Sea Challenge – a $10 million commitment to build or rehab a Habitat for Humanity home in each of North Carolina’s 100 counties. Once the homeowner assumes a zero-percent-interest mortgage from SECU, the money is returned to the Habitat affiliate so that another home can be built. Eric Edwards will be the new owner of the house on Palmer Street.